You see, my goal was to stay focused on my role as a Declare Conference hostess. I didn’t want to speak in a breakout session or up front and end up being double minded. But our worship team (& God) had another idea. They asked for each hostess to speak during Friday evening worship. The weeks leading up to the conference God led me to the book of Nehemiah. It seemed pretty random but the more I read, the more I found His message for Declare. If I needed any more encouragement, the day before the conference started I took the boys to the library to pick up a book on hold. While waiting to check out Watts came up to me and said, “I want this movie.” And being a little stressed and distracted my response was “Not today buddy. We’re just getting this book.” But in classic Mac boy style he persisted. As I finally looked at the DVD he shoved my direction I realized I would change my “no” to “yes”. My sweet little 4 year old handed me the “What’s in the Bible” of Ezra & Nehemiah. For real. Of course we sat down that afternoon and watched it together. I realized God had something important to tell our Declare attendees (and hopefully for you, too). Lord, You are Holy, Worthy of Praise, Mighty Savior. You are at work all around us. He invites you to join Him. Whether you feel the work is bigger than your abilities (choked on my words here) or too small to be worthwhile. He has work for you to do. Both men did God’s work. One built a temple, the other a wall. The temple, a place for God’s presence to dwell may seem like the important task and the wall may seem insignificant. But God required both. And both men answered the call. You see they were living in a foreign land, Babylon. When they heard of the brokenness back home in Jerusalem, they responded. Their hearts were moved. In fact, from these books we learn God is in the “heart-moving” business (Ezra 1:5; Neh 2:12). He even moved hearts of Kings (Ezra 1:1) to make a way for Ezra and Nehemiah to complete God’s work. If you are discouraged in the task God has set before you, realize God can make a way. He can move hearts of the powers that be to accomplish His purposes. But even when we do God’s work and even though we belong to Him, we live in a fallen world. We will face opposition and discouragement. And that doesn’t mean we are doing something wrong. Nehemiah had real enemies trying to keep Him from building the wall, afraid of what would happen if Jerusalem were secure. A man named Sanballat tried to distract him from his work, inviting Nehemiah to come away from his work and “go talk”. You. You are doing a great work, God’s work (even if it seems unimportant to you, if He has called you to do it, then it has value). Do not get distracted. Do not stop. They asked Nehemiah to come talk with them…4x. Each time he gave that same answer. 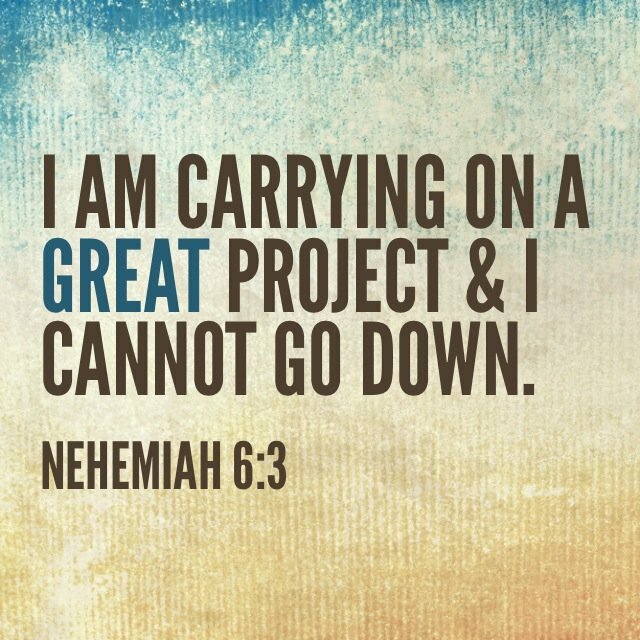 God will give us the strength to accomplish His work. You have to be ready because the enemies (the world, the flesh & the evil one) will continue to attack. You will start to get tired especially if you work with all your heart (Neh 4:6). You must have a battle plan. Nehemiah had a plan. He stationed families (don’t you love that) around the wall (Neh 4:13). He encouraged them to remember the Lord who is great and awesome and to fight for their families and their homes. 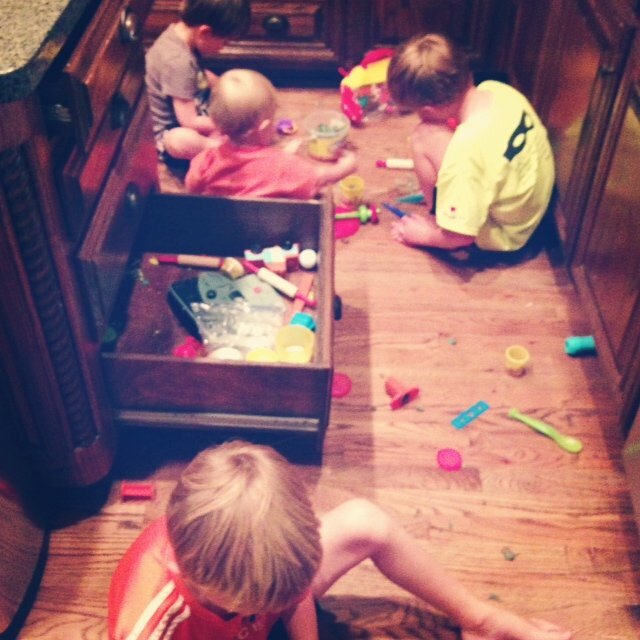 entered the kitchen and found this…struck by the beauty of all boys heads bowed, hands creating, working together and individually. We need each other, as brothers and sisters in Christ-the Lord’s family stationed on the wall. Half of us doing the physical work and half ready to fight the spiritual battle–in His Word (sword of the Spirit) and prayer. We may not be doing the “exact” same work but both are important to see His work accomplished. For the exiled Jews it was to rebuild a wall (which may not seem that important to us). That wall protected God’s chosen people, so a girl could eventually be born who would honor God and carry His son. That Son would come and die on the cross for our sins and be raised again. Our work, our “wall”, now is to spread the good news that we can live eternally with the one who saved us from the power of death. Because do you know what was said when the wall was complete? May they same be said of us…that our work has been done only by the help of our God! Because when all have heard the good news we know Christ will return! He. will. return. It’s going to happen. Let’s rise up and do it! What work does God have for you to do? How can we help you do it? I would love to pray for you, stand next to you as you work, fighting off the enemy. Thank you for the notes from your talk! The only bad thing about holding a baby was not being able to take as many notes as I wanted. 🙂 I really enjoyed rereading what you had to say. What an amazing weekend it was. Thank you all for the time, energy, and effort that was put into it. God is good. I’m looking forward to seeing how God directs me and what He calls me to do. thanks for your constant encouragement and kind words. you are a gift! thank you for your encouragement. and seriously thank. you. for making sure we got to talk. I’m struggling that I didn’t have more conversations and if you hadn’t been asking me to talk I wouldn’t have stopped. So really, really, thank you for making time to talk. Thankful to continue the conversation! Amen…I love that story and how you shared it. Thanks for writing it down for us. thanks for coming up to me and sharing your face-to-face encouragement. you re-affirmed a call I had been ignoring. thank you! oh yes erin! we can never forget that the “great project” God may be moving our hearts to perform, is to meet the physical, emotional and spiritual needs of our children. Not a small thing. Carry on sister and “do not come down” from your work! Loved this. I studied Kelly Mintor’s Nehemiah this summer and loved the points about their hearts being moved to action. I needed this reminder today! Hope to make it to Declare one of these days! oh! I love Kelly Mintor! I didn’t know she had a Nehemiah study…probably good I didn’t. Otherwise I would have been afraid to share because she is so talented. We would have LOVED to have had you at Declare…will you be at Allume? AMEN! I love your heart. I absolutely loved being at Declare last weekend and felt like we had a glimpse of what Heaven will be like as we worshipped God with our brothers and sisters. Definitely a glimpse of heaven…thank you for being with us Sarah! thank you angi for your kind words and for constantly encouraging me last weekend. you are a treasure and God is doing some awesome things through your faithful service to Him. Keep it up! Oh sweet Heather, I have so many beautiful memories from the Declare weekend. Thank you, thank you, thank you. I loved putting a voice to your words, and hugging you for real. thanks for the hugs…and the notes…and the prayers. you are a true encourager. Thank you for making the long trek to be with us! Yes! SO glad you posted this. I was trying to take mental notes the entire time you were speaking but there was SO MUCH GOOD that I couldn’t take it all in at once. Gosh, what a great weekend. Your obedience and the obedience of others has been the biggest blessing to so many of us!